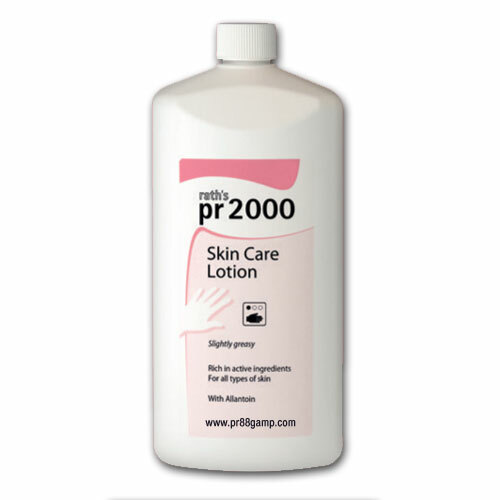 pr2000 Skin Care Lotion (1 Liter) | pr88 / GAMP Inc.
pr2000 is a pleasant, smooth, easily absorbed oil/water lotion which contains various vitamins, active ingredients and natural raw materials. It contains a total of 19 ingredients, such as Vitamins E, F, and D, and Alpha-Bisabolol, which regulate moisture, return oils and fats and in general, condition and care for the skin. Supports the regeneration of the natural state of the skin by ingredients with re-moisturizing, moisture regulating, anti-inflammatory and wound healing effects. pr2000 is a pleasant, smooth, easily absorbed oil/water lotion which contains various vitamins, active ingredients and natural raw materials. pr2000 contains a total of 19 ingredients, such as Vitamins E, F, and D, and Alpha-Bisabolol, which regulate moisture, return oils and fats and in general, condition and care for the skin. All the ingredients are beneficial to the skin and do not interfere with the environment. Because of these properties, pr2000 is suitable to be used on the entire body. pr2000 is applied after washing by massaging the lotion into the skin. pr2000 is absorbed quickly, spreads easily, and leaves a pleasant “feel” to the skin. pr2000 should be used on a regular basis after a shower or a bath, as it improves the skin’s natural physiological protective function, as well as helping to maintain and regenerate skin which is stressed on the job or by the environment. pr2000 is also skin friendly and skin type neutral, which makes it suitable for all skin types.